Authentic Keith Brymer Jones original large jug (500ml) with “milk” hand-pressed with a master craftsman’s touch to create a unique impression. Part of the Keith Brymer Jones Word Range. Serve breakfast in style with this large designer milk jug, hand-stamped with the word ‘milk’ in Keith’s eye-catching retro typewriter font. Crafted from hard-wearing super white porcelain, this elegant piece of tableware will add personality and a hint of vintage to your kitchen or dining table. 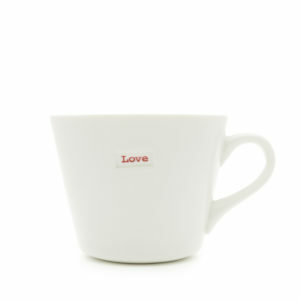 This 500Ml milk jug is even more eye-catching when combined with other items from the Word Range. Dishwasher safe and microwave safe.